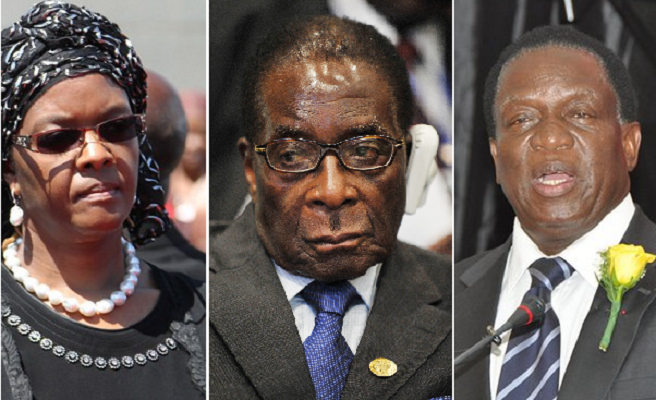 ZIMBABWE – President Robert Mugabe has once again made it clear that he has no plans to name a successor while he is still alive, also dismissing speculation that he plans to cede power to his powerful wife Grace. Speaking in a belated birthday interview with the State broadcaster, ZBC TV, last night, Mugabe said Grace’s surprise rise to power in the ruling party in 2014 did not mean that she was poised to take over from him. He also spoke out in the first interview against the worsening factional and succession wars ravaging his ruling Zanu PF . “Uyu hanzi akazosiiwa ari panzvimbo. Inhaka here?… I think it’s ridiculous and for that matter vamwe vanoti aah president vanoda kuzosiira mudzimai wake kuti asare achitonga. “Ndekupi kwawakambomuona kana musystem yedu tichiti mukadzi wangu anozogara nhaka yangu? (People are engaging in idle gossip about who will succeed me, as if this is some form of inheritance where I can say my wife will take the reins when I’m gone),” Mugabe said. “KwaGushungo hazviitwe izvozvo. Kwenyu zvinoitika? (In my Gushungo clan we don’t do that. Is this what you do where you come from? )” he asked rhetorically. The First Lady’s rise to the leadership of the ruling party’s women’s league and having a seat in its powerful politburo has fuelled wild speculation within the former liberation movement that she was aiming to succeed the increasingly frail nonagenarian. The speculation got wings when Grace said at one of her rallies last year that as a Zimbabwean she had a right to aim for the presidency. But Mugabe said last night his successor could only be appointed by an extraordinary congress after he was gone. “Vakuru vanozosara voona kuti ndiani anga aine kodzero yekugara nhaka, vanombotanga vaona kuti uyu anosara akabata pamusha anonzi ani . . .ozogadza nhaka (Traditionally, elders left behind will sit down and look for the most deserving successor). “Now, in a democratic party you don’t want people, you know, leaders, appointed that way to lead the party. Saka vaye vanoti, aah pinda iwe ndigozopindawo, kuzvinyepera (Those who are jostling for power are wasting their time), it doesn’t matter who. “They have to be appointed properly by the people . . . kugathering yecongress. Usina kuitwa appoint ikoko hapana chako. (If you are not appointed by congress, tough luck to you),” he said. Mugabe, who has ruled Zimbabwe since the country’s independence in April 1980, claimed that outlining a succession plan when an incumbent was still alive was alien to local culture. When ZBC TV’s Tazzen Mandizvidza suggested that perhaps the lack of a clear succession plan was fuelling Zanu PF’s infighting, Mugabe retorted: “You want a successor when I’m still there? “Why do you want a successor? Or else unoda ndikurove chibhakera ugowira pasi to feel kuti I am still there,” he said chuckling and pumping his clenched fist in the air.